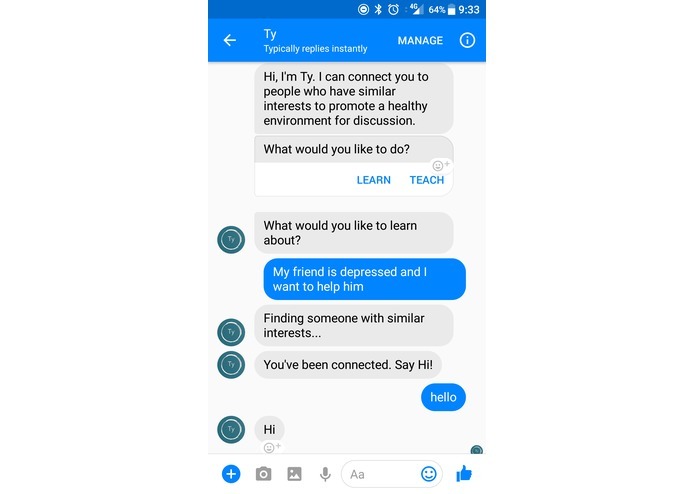 Screenshot of conversation between young adult and mental health professional monitored by Ty. We want to create a welcoming online environment that encourages healthy discussion between people with similar interests. 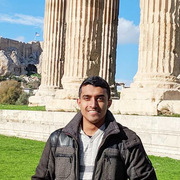 For example, sometimes young adults don't feel comfortable talking about certain subjects with family members, so creating this bot helps them remain anonymous while talking about more sensitive topics. Ty pairs two individuals who have similar interests: one who wants to learn about the subject, and another who can teach about the subject. The two people message each other through the bot while both remain anonymous. Throughout the entire conversation, Ty monitors the conversation for NSFW content, rude/hurtful statements, and off topic comments. If a user messages explicit/rude material, the bot blocks the content and prevents the other user from seeing the blocked message(s). We started with a Flask server running on AWS that handles requests from Facebook Messenger using the Graph API. We then determined the sentiment and the topic of each message using Microsoft's Cognitive Services API. We also used Python NLTK Library to extract key information about the content of the message. Images are classified as NSFW using Clarifai's NSFW Model. Ngrok limited the number of calls that we could make to only 20 calls/minute. The chat bot functions properly. We learned how to implement Microsoft's Cognitive Services to specify how Ty monitors the chat.